Above: A mother and teen hit the powder at Taos Ski Valley. MY LOVE OF SKIING BEGAN at Ski Santa Fe when I was six years old, back in the days of leather boots and wooden-edge skis. I didn’t need any encouragement to roll around in the white world, but today ski areas lay out magic carpets for their pint-size rippers, along with a host of family-friendly après-ski fun. With kids-ski-free options and other inducements, opportunities to introduce your children to skiing the easy way (i.e., letting someone else teach them while you enjoy the slopes) have never been more available. Here’s the lowdown on what New Mexico ski areas offer for families, on the slopes and in the towns. Ski Programs: The big kahuna in almost all things skiing in New Mexico, Taos has top-notch facilities and programs for tots, kids, and teens. Day care is available for infants six weeks and older in its completely renovated Children’s Center, and on-snow play and instruction begin at age three, with programs designed for kids up to age twelve. Others aim specifically at teens, taught through the famed Ernie Blake Ski School. Kids who live near Taos can sign up for four-week sessions of weekend lessons. Children have their own kids-only ski zone with pee-wee-size lifts and a rental shop. Besides its advanced and expert terrain, Taos also has ample beginner runs for younger skiers. The most basic terrain is split between two sub-areas at the resort base, each with its own chair and roped-off slopes where young and timid skiers and snowboarders can get their game on. For those who have mastered the wedge, several suitable runs descend from the ummit, including Whitefeather, Powderhorn, and Porcupine. As kids, we spent countless days on these slopes and never grew tired of the thrilling descents, stupendous views, and combinations of easy stretches and challenging pitches. Other Options: Thrill away at the inner-tubing operation on the beginner slopes of Strawberry Hill after skiing closes at 4 p.m., during holidays and peak periods. A short lift provides uphill access, and clear, safe lanes for coming down make this appropriate for people of all ages—and it’s free to those six and under. Guided snowmobile tours to area peaks and ridges are available through Big Al Tours (575-751-6051; bigaltsv.com). Ski Programs: This family-friendly resort starts with Snow Bear Camp, a childcare program for six weeks to eleven years old. It includes a nutritious lunch, snacks, and—for those capable—at least an hour skiing in a separate safe zone with a magic-carpet lift (similar to the conveyor sidewalks at airports). The facility is just above the Chile Express Chair. The Little Chiles program for ages four to six includes more time on the snow, rental gear, instruction, and lunch. The Lil Poppers program gets small groups of four- to five-year-olds out on snowboards. For ages six to twelve, check into the Mountain Explorers and Mountain Adventures programs for skiing and snowboarding. With a high percentage of beginner and inter-mediate slopes, much of Angel Fire can be skied or boarded by novices. One run, Headin’ Home, descends gently from the summit and runs into the resort’s back side, good for skiers just finding their legs. Angel Fire’s terrain parks, the state’s best, also appeal to younger skiers and boarders. The advanced complex, Liberation Park, sits atop the mountain, with progressive lines of jumps, rails, and boxes, plus its own short lift. It attracts serious athletes from all around the region and hosts some significant annual competitions. Night Rider Park, at the bottom of the mountain, is accessible to riders during night-skiing evenings. Sweet Street is the beginners’ park along the bottom of Headin’ Home. Angel Fire also has the only night skiing in the state, with about 50 acres and a terrain park open. Hit it on Fridays and Saturdays, 4–8 p.m.; it’s also open on some holiday and peak-period nights. Ski Programs: Kids under 46 inches tall ski free. If they need lessons, Chipmunk Corner is kid central. My own two groms attended it while Daddy skied, giving them a fun introduction to the sport. Nursery and day care services are offered for ages three months to three years. Potty-trained children go to the Snow Play program, with outdoor and indoor play, plus lunch and a movie. Kids ages three to eleven are sorted by age and ability for on-snow instruction, conducted either on the kids-only slope, with its own magic-carpet lift, or on the regular slopes. Kids ages ten to eleven have the option of attending the regular ski school program, without the attendant care. Ski Santa Fe also hosts a six-session program for local skiers ages five to twelve, and for snowboarders ages seven to twelve. Private lessons are available to all ages. Other Options: A dedicated snow-play area lies down the road in Hyde Memorial State Park; also try the unsupervised Big Tesuque picnic area. In town, off-snow activities range from the fantastic Meow Wolf experience to the Santa Fe Children’s Museum, art classes, horseback riding, and bike rentals. Ski Programs: Red River’s family offerings start with its Buckaroo Day Care, in the Main Chalet, for ages six months to four years. The Youth Ski Center provides group and private ski lessons to ages three through twelve and to snowboarders ages seven through twelve. Lesson packages can include up to four hours of lessons, a lift ticket, rental equipment, and lunch. Terrain park lessons are also available. Bonus: private lessons for three-year-olds; plus children three and younger ski free. Other Options: The one-hour tubing session starts at 4:30 p.m. with a magic-carpet lift. On busy days a second session is offered. Buy tickets in advance online. Red River is one of New Mexico’s centers of snow-mobile culture, along with Chama, Angel Fire, and Ruidoso. Bobcat Pass Wilderness Adventures (575-754-2769; bobcatpass.com) and Red River Sled Shed (800-395-0121; redriversledshed.com) offer tours. Red River Offroad (575-754-6335; redriveroffroad.com) leads snowcat tours. The town and ski area also host many special events aimed at families and kids. The town’s annual Winter Carnival—with parades, ice carving, snowmobile races, and fun ski races—is January 13–14. Kids also love the free evening torchlight parades and fire-works during holidays and peak periods. Ski Programs: The most affordable of all New Mexico ski areas, with package deals that include free lodging with the purchase of a certain number of adult lift tickets. Intimate and old-school, it’s the kind of place where you can let the kids run free. While there are a few short, steep pitches, most of the area features beginner and intermediate terrain, so parents can let their charges take off in the morning and not worry about them getting in over their heads or lost. There is no formal day care program. Ski School group lessons are available for skiers and snowboarders seven to twelve years old; private lessons start at age three. Older kids will enjoy Sipapu’s four terrain parks, including the only “organic” ones in the state, Playground and Flight School, built entirely from resources found on the mountain. The advanced park, Don Diego, includes a 20-foot A-frame box with a dragon tongue (including two urban takeoffs and a straight mount) and a 38-foot tabletop gap jump. It often does not open until January or February. Pedro’s Park is designed for beginner and intermediate riders. Other Options: On Wednesdays at 6 p.m., see free family movies in the main lodge, which also has a small game room. Tubing and sledding can be done on nearby property off the resort. 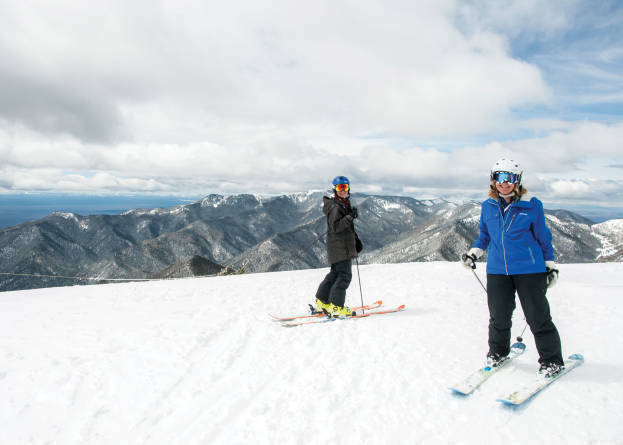 Ski programs: This family-centric ski area and its nearby base town of Ruidoso are especially beloved by Texas visitors. Full-day services are available at its day care center, and ages four through eleven will enjoy the Adventure Center for all-day or half-day ski instruction, lunch, and lift tickets. Children under six ski free. Other Options: The ski area’s Windrider Ziptour is one of the longest in the world. Split into three legs, it runs almost 9,000 linear feet from its upper elevation of 11,489 feet. It operates year-round (weather permitting) and has parallel cables allowing two riders to descend at once. The experience takes about 1 hours. Reservations: (575) 464-3633. Near town, the Ruidoso Winter Park snow-play area (575-336-7079; ruidosowinterpark.com) is a great place to go tubing. Courses include twists, bumps, jumps, and bobsled-like curves. A snowmaking system ensures good conditions most of the winter, and there’s a special area for the very young. Multiple magic-carpet lifts transport you uphill. Rentals (including clothing), a snack bar with excellent pizza, and free marshmallow roasts at the campfire are all available until 5 p.m. most days, and 8 p.m. during peak periods. Ski Programs: Albuquerque’s backyard romper room is a great place for kids to learn, thanks to its easy terrain, small size, and relatively low prices. Kids under 46 inches tall ski free. The Snow Sports School offers group lessons for skiers and snowboarders ages seven through twelve. Cubby Corner, for ages four through six, provides ski instruction and rentals. Snag an all-day beginner lift ticket, with rentals and a four-hour lesson for $80. Ski Programs: The ski area above Los Alamos has an old-time feel and modest prices. Skiers younger than seven ski free. Group lessons are offered for skiers ages six and older and snowboarders ages eight and older; private lessons for anyone over age four. Lift tickets for ages seven through twelve run a thrifty $34, with beginner tickets just $24. Here are New Mexico ski areas’ estimated openings, but watch the forecast and check skinewmexico.com for details.